2Ch 15:2 And he came face to face with Asa and said to him, Give ear to me, Asa and all Judah and Benjamin: the Lord is with you while you are with him; if your heart’s desire is for him, he will be near you, but if you give him up, he will give you up. 2Ch 15:7 But be you strong and let not your hands be feeble, for your work will be rewarded. 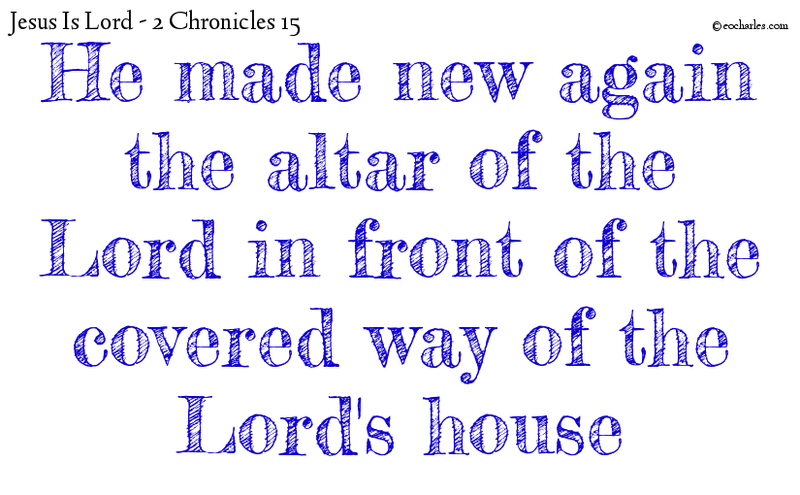 2Ch 15:8 And Asa, hearing these words of Azariah, the son of Oded the prophet, took heart and put away all the disgusting things out of all the land of Judah and Benjamin, and out of the towns which he had taken from the hill-country of Ephraim; and he made new again the altar of the Lord in front of the covered way of the Lord’s house. 2Ch 15:15 And all Judah was glad because of the oath, for they had taken it with all their heart, turning to the Lord with all their desire; and he was with them and gave them rest on every side.